The largest seahorse species ever recorded is the Pot Belly Seahorse at a length of 35 cm (13.7"). 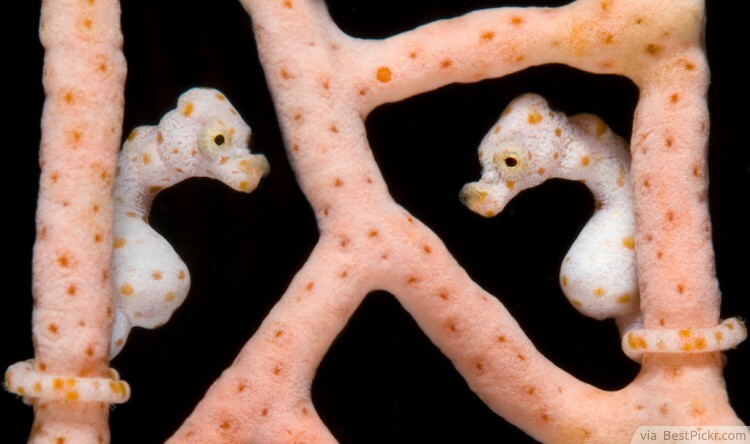 The smallest seahorse ever recorded, the Pygmy Seahorse, is only approximately 1.4 cm (0.5") long. Most of the bigger sized species are found in cold temperate waters. The size is to give them the advantage of enduring stronger currents and to hunt for food in larger areas. In comparison, the smaller tropical seahorses do not have to search far in the warm waters where food is abundant. Tropical seahorses also have relatively smaller dorsal fins than their temperate counterpart. The next time you go diving, try and find the differences you can observe between the species living in those two regions.